This is an opportunity to evaluate your courses. The college uses this information to evaluate the instructors and their courses and provides instructors with an opportunity to improve their courses. Courses are evaluated in different groups called “projects”; you may have courses in one or more of these projects. The projects can have different evaluation open and close dates; therefore, you may receive more than one email notice. Evaluations are open-the day the evaluations are available for students with link to evaluations. Pre-survey announcement-sent two (2) days prior to the opening of the evaluations. Non-responder email. You will only receive this email if you have not completed the course evaluation. One email will be sent 4 days before evaluations close and the second email will be sent 2 days before evaluations close and will contain a link to the evaluations. 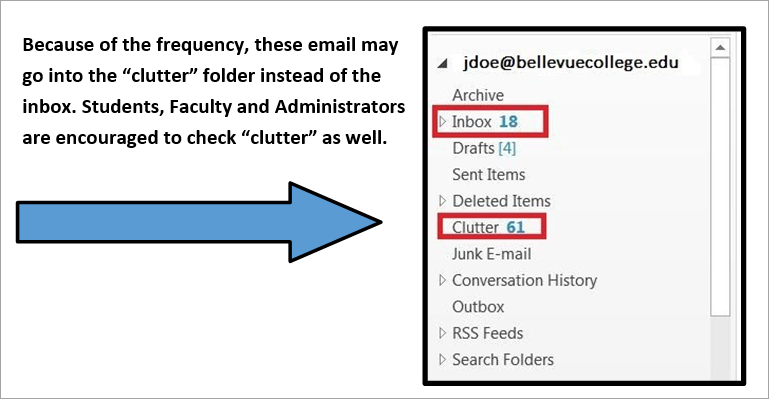 Be sure to check both the “clutter” and “junk” folders in you BC email, if you cannot find it in your inbox. There are three (3) ways to access evaluations. Your course evaluation/s are now available! (Note: start/end dates may be different for different courses). As a student of Bellevue College, you have an opportunity to provide us with feedback by participating in the student course evaluation pro- cess. How much time will it take to complete the evaluation? Usually 10-15 minutes. Where can I access the evaluation? Through the “widget” on your Canvas dashboard or the “widget” in each course. These are located on the right side. How long do I have to complete the evaluation? The evaluations will close on (date). You should complete them as soon as possible. What if I run out of time while taking the evaluation? You will have TWO OPPORTUNITIES to save results and return to complete the eval- uation late After two times you will need to finish the survey. Select this link to Login to access your course evaluation. Once you have completed the evaluation(s), you will receive a “Certificate of Comple- tion” in your Bellevue College email. Message appears after logging into Canvas. This message will only appear when the evaluations are open. Once evaluations are complete, the message disappears. or the “widget” in each Canvas courses. The widgets are located on the right side of the screen. The widget will list the day the evaluations begin and the day they close. You will notice it also indicated how many days left to complete the evaluation. Step 4: You have to option to save and return later and finish. If you start filling out an evaluation and need to stop for some reason, you can save your results by clicking on the “Come Back Later” button at the bottom of the evaluation. You have the ability to save it twice. The third time you start the survey you will need to complete the survey. Step 5: Submit your evaluation. Once you submit your evaluation, you will be returned to your EvaluationKit Dashboard. You will notice that completion date and time are noted next to the completed evaluation. See image below. Having trouble accessing your evaluations? Go to Evaluation Kit and Browser Cookies. A screenshot depicting the issue you are having.